Here are some Social Problems due to the Misuse of Mobile phone. Cell phone use in social situations may result in overloading – both physical and mental. Local interaction with the surroundings and remote interaction with the other person demands certain attention- E.g. When you talk in a bus stand or crossing the road. Cell phone use in public place makes the user blind to local cues due to cognitive overloading. E.g. when you use cell phone while walking through the road, you may not see a vehicle coming close to you. Cell phone use in public places increase the reaction time to events around the user. E.g. You will not get time to move away from a danger. Reduced attention to local situation may disturb others since the user is not attending the social situation. E.g. Your conversation and body language may be annoying to others. Use of Mobile phones in gatherings, meetings, entertainment places etc disturb others through inattention blindness. Caller Hegemony is the asymmetric relationship between the caller and answerer.The alarming ring tone may demand higher attention to the phone rather than the local settings. If you use cell phones in busy areas, trains or buses, the sudden ring tone may alter your attention or the message from the caller may cause a disturbed feeling. This will leads to inattention blindness. This will not be the condition, if you use a land phone. Mobile phone use in public places makes the user overloaded and become unaware of the details of communicative behavior of co- located individuals as well as other relevant features of the social situation. It is advised that not use cell phones while driving a vehicle or operating a machinery or crossing the road. Mobile phone use while driving may cause accidents due to inattention blindness and cognitive load. Cell phone conversation distracts the driver’s attention, increases reaction time, and reduce the visual field attention. Cognitive load rises above visual sensation and diverts attention. Memory of visual inputs and Response will drastically reduce if the cognitive load increases when using cell phone along with driving. The same negative effects may also happen if the driver uses a hands free phone. E.g. If the actual distance between two vehicles is 5 meters, due to cognitive load, the driver may feel that, it is 10 meters. This is the reason for majority of accidents, if cell phone is used in driving . With the increased use of Camera phones and Multimedia facilities and Blue tooth technology, mobile phone related cyber crime incidents are increasing. Cybercrime includes traditional activities such as fraud, theft or forgery, whenever a telecommunication system is involved. The word Cyber is derived from the Greek word Kubernetes meaning Steersman .It is used in the terms cybersex, cybernetics, cyberspace, cyberpunk, cyber homes and cyber hate etc. It is used in the computer or electronic context to denote control of the thing represented by the word it precedes. Over use of Cell phones may cause two New generation Psychological problems. This is the Panic condition caused by the lose of cell phone contact in cell phone addicted individuals.No credit, flat battery, lose of phone or no reception etc can bring a panic symptom referred to as NoMo Phobia or No Mobile phobia. To overcome NoMo phobia, two methods are suggested. One is to keep the battery in top condition and the credit sufficient. Another method is, deliberately avoid mobile phone for few hours and then few days. Then you will feel that it is not an important thing. This is an anxiety symptom related to the over use of mobile phone, a form of addiction. Ringxiety refers to the sensation and false belief that the mobile phone is ringing or vibrating. The term is also used to explain the condition in which a person frequently takes the cell phone to see whether there is any a mis call or messages. The person will always give a priority to cell phone than his personal activities. Mobile phone technology uses electromagnetic radiation in the Giga hertz range. These radiations are close to microwave range and with similar properties. Part of the radio wave emitted from the mobile phone is absorbed by the human head. 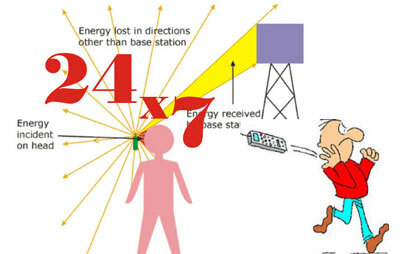 The radiation emitted by a GSM handset can have a peak power of 2 watts. The rate at which radiation is absorbed by the human body is measured in terms of Specific Absorption Rate (SAR) and its maximum levels for modern handset is set between 1.6 to 2 W/Kg averaged for 1 gram tissue. If the SAR level is above the limit, it may cause both Thermal and Non thermal effects in the body especially in the ear and head since these are at the “Near Field” of the radiation. Thermal effect of microwave is the dielectric heating in which any dielectric material such as living tissue is heated by the rotations of the polar molecules such as water. In the case of a person using mobile handset for hours in a day, most of the heating effects occur in the earpinna, internal ear, head surface and even in the brain. Internal ear has fluid filled structures which are more susceptible to the heating effect. Brain tissue is delicate which can be affected if the radiation exposure is severe. Some of the brain waves that determine the mood and alertness resemble the mobile radiation in frequency. So that normal brain functions can be affected even in a few persons using mobile phones continuously. Another structure that can be affected by heating is the cornea of the eye. It is the transparent covering present on the front part of the eye. Cornea lacks blood supply, so that the heat generated there cannot be removed easily and it may cause premature cataract. Non thermal effects include alterations in bio-cycles, cellular metabolism, spermatogenesis, abnormalities in foetal developments, miscarriage etc. Some users of mobile phones feel several unspecific symptoms during and after the use of mobile phones in the form of burning and tingling sensations, fatigue, sleep disturbances, dizziness, loss of mental concentration etc. All these effects may be due to the influence of radiation on the biomagnetic field of the body. • Brain waves such as alpha beta ,delta waves will be affected when exposed to pulsed radiations. • Microwave induces electric current in the hearing centre of the brain and causes Auditory illusion. This may happen if music is heard using ear phone or Bluetooth for long time.The human ear has a peak sensitivity of 3000 Hz, which causes a sense of unease. Alarms and Mobile ring tones are designed to sound at 3000 Hz.The ear has a very low threshold of hearing for 3000 Hz. A sound of this frequency is very penetrating. Pain in the ear without any specific reasons like infection. This may be due to increased stress on the delicate structures of the internal ear or ear drum by the radiation. The cell phone monitoring softwares evolved as a necessity to locate the phone through the satellite network and also as a measure to monitor the online activities of children. Basically the spywares are Parental control softwares to protect children from online cheating. These spywares also help to watch the activities of suspected persons and to track the location of the phone in emergency situations if the user is unable to make a call. By using the Google Map tracking of the location is possible. Along with these positive aspects, misuse is also coming in to intrude into the privacy of people. 1. Live listening – The spyware programme enables the hacker to listen the live conversation between the caller and the answerer. 2. Text message retrieval– All the SMS received or Send from the spyware installed phone can be retrieved and recorded. 3. Video enabling– If the spyware is installed in the phone, the Images, video clippings etc stored in the phone can be viewed online. 4. Call logging– This feature of the spyware allows the hacker to check all the incoming and outgoing calls. 5. GPS tracking – This facility helps to track the location of the phone. 6. SMS Interceptor – This facility helps to read the SMS send or received at any time even if the message is deleted. 1. Check the phone, if somebody borrowed your phone for making a call or to see the visuals. If there is any doubt, immediately format it. If a memory card is present. Format it also. 2. Don’t accept Bluetooth sharing or connection with unknown persons. 3. Clearly watch the behavior of cell phone after a Service. 4. As long as you are careful, there is nothing to worry about the spywares since even if infected ,a clean formatting will erase all the spywares and viruses from the phone. As you know, Cell phone is a radiating device emanating high power electromagnetic radiation into the atmosphere. It requires very strong radiating power in the Giga hertz range to make continuous link with the far located towers. Knowingly or unknowingly, most people keep cell phones always close to their body even during sleeping. Even though the cell phone is inseparable from the modern living, we can reduce the harmful effects by following some safety measures. 1. Keep away the Cell phone from Kids. Children below 10 years are more susceptible to cell phone radiation. The cranial bones are not thick in children, so chance of penetration of radiation in to the brain in higher than in adults. 2. Don’t keep or use the Cell phone near the New born baby. 3. Always make short duration calls using the Cell phone. Switch on the cell phone only for making the call and switch off after the use. If you are a busy person waiting for many calls, keep the cell phone on the table or use a Bluetooth device. 4. Always use Land phone or wired phones for longer conversations. 5. Don’t always keep the Cell phone close to the body. Use a Pouch or Bag to keep the cell phone. 6. After making a dial, wait for few seconds till the remote person attend the phone. During dialing and ringing, level of radiation is very high. During conversation, move the phone away from the ear occasionally to spread the radiation. 7. If possible, use the Cell phone in Speaker mode. 8. Try Text messaging instead of Call making. Keep away the Cell phone after sending the Message. 9. Avoid the effects of Passive Radiation by moving away from people using the Cell phone. 10. Avoid using the Cell phone in moving vehicles like Car, Train, and Buses etc since the Cell phone emits double amount of radiation to keep link with the strongest tower. 11. Activate the Miscall alert, Voice mail service etc so that, these can be checked occasionally. Answer all and switch off immediately. 12. Don’t keep the Cell phone on the bed during sleep. It will significantly affect the sleep cycle. 13. Don’t use Cell phone during or just after charging. Radiation level is very high if the battery is full or charging. 14. Before making a call, check the range indicator in the Cell phone. If it is poor, wait until it reaches full range. Radiation is very high in low range condition since the cell phone is trying the make link with a tower having strong signals. 15. If you want to keep the Cell phone in your pocket, keep the key pad side facing the chest. 16. Don’t use the Cell phone in tightly closed rooms especially those containing metal walls. Radiation will reflect back and hit your body. 17. Don’t keep the Cell phone near or on the Electronic Medical equipments or other sensitive devices.Radiation can make them Erratic. 18. Don’t use Cell phone in Petrol outlets or near LPG cylinder. The Static electricity in the atmosphere may explode by the Cell phone radiation and may cause fire. 19. Smartphone emits large quantity of radiation since it is performing multifunction like a computer. Don’t keep it close to the body for long time. 20. Like Cell phones, Laptops also generate very high radiations. So don’t keep it on your Lap. Laptop is not good for the Lap. Around 70 degree heat is expelled by the fan present on the bottom side of the laptop. This is sufficient to heat up your lower abdomen. 21. Always keep a Safety distance from Electronic devices that emitting radiations. As a rule, the safety distance is 3 feet for computer and 6 feet for TV . If the Cellphone has Mind and thoughts, it will ask you many questions…. 1. Why you are using me when you are on wheels? 2. Why you are unnecessarily puncturing my keypad? It is painful. 3. Why you are keeping me on your bed. I don’t like to sleep with you. 4. Why you are forcing me to talk unnecessarily in the morning hours when the people are busy in home or road? 5. Why you are forcing me to snap without others permission?I will also be trapped. 6. Why you are forcing me to play music continuously. My sound is piercing and your ear will be strained.I am tired and my job is contacting only. 7. Why you are compelling me to send Miscalls. Value of money is same for all. These points were collected from various sources.Readers can contribute much in this topic. If you have any unusual experience or incidents due to cell phone misuse, please write the matter in the Leave a Reply Space and Post comment. There are consequences on almost everything and having a mobile phone is of no exemption. Bottomline, put this into good use. Use only when needed, avoid too much playing games to avoid draining the battery so that when needed, it’ll always be of good service to you. This is a real problem facing…. See this mail from Kolkata. house approx 50 feet away ,height of the tower is near about 60 feet. what is the cause, but now we can feel that the micro wave radiation is causing this. shield our house from bad effect of radiation. procedure by which we can monitor it at our house. I am waiting for your kind suggestion. Good article. Please write in newspapers.